Pink Stars Affect Highlights/Season Mission RSL? I'm about to upgrade a full team (1 of each survivor class) to 8-stars. It's been so long since I had a pink star bump, and I forgot if going up another star increases the RSL for the weekly Season Highlight Trials (or whatever they're called nowadays). I know it affects Scavenge RSL, but I can't recall what else. Any help? Also, is there anything else I should consider before taking the next-star-plunge? Are there downsides I'm not considering? Same. So if I upgrade someone to 8-stars, my Normal Scavenge will be 24 and Hard will be 27...and my Trials will be 21-25? With 8 stars scavenger normal RSL is 23 and hard is RSL 26. Pink stars don't effect the season missions as I recall. Interesting...So it doesn't go up. @Fearofabotplanet @Shteevie Is there any specific verbiage on how Pink Stars affect RSLs for non-Challenge Game Modes (I know they don't affect Challenges)? @SCBMA Do you have Level 22 or 21 survivors? I am pretty positive pink stars affect Scavenge Missions..
All of mine are level 22. Cool! Can you let me know tomorrow when the Highlight comes up what your Trial Range is? Is it 20-24 or 21-25? Thanks @SCBMA !! Will do! I am pretty sure it is 20 - 24 but will confirm tomorrow. The elite stars affect a given game mode consistently. So if you saw a difficulty increase in Hard Scavenges when promoting from 5 to 6 stars, you'll see the same kind of change for promoting from 6 to 7, and from 7 to 8, and so on. Confirmed that pink stars do not impact highlight missions. I started at RSL 20. @Shteevie So for the record, which game modes are they intended to affect? Only Scavenge, or also Trial/Highlight/Season Missions? Bummer about Scavenges, as I bring Maggie along for the XP boost but she's only Epic Level for me, so it'll make it tougher to farm when the next council upgrade comes -- how do the rest of you "elites" deal with that? Only intended to affect Scavenges. If you are able to beat the hard XP scavenges, the higher difficulty means that you'll get more XP / kill. With Maggie added in, that can add up quick. Personally, I do Outpost or Scavenge at the end of a session if I'm not playing the Challenges so that the injury time doesn't slow me down. Even one per session can really make a difference on the speed you get characters leveled up. I have found mathematically that farming Normal Scavenges with Maggie nets the most XP by far, since you can kill more walkers. 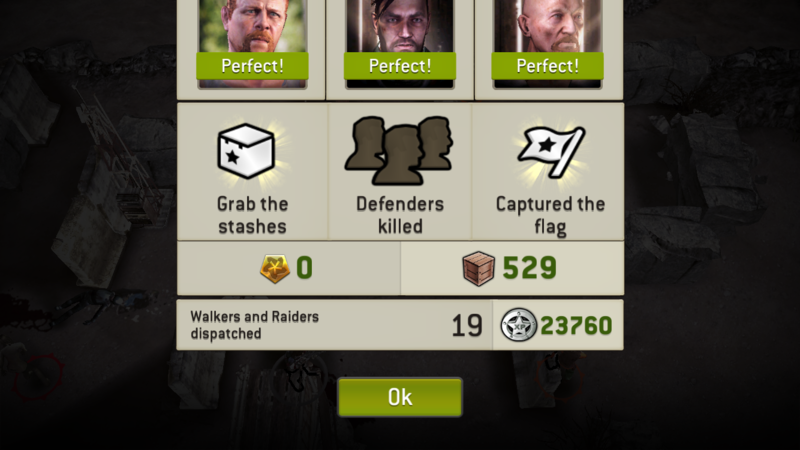 The problem, @Shteevie, is that while the rest of my team is 8* and capable of non-body-shotting on those high level walkers, Maggie is not (since she is only Epic). This makes farming harder. 332,640 XP (which is with 2x kill boost) + 7,000 TG's for 14 runs (28 gas used) with each outpost taking about 75 seconds. @General_Quatre I'm curious with using Maggie in scavenger with the 100 Kill cap what type of XP are you getting? 23,760 XP is of course doubled so it would be 11,880 per 2 gas (29,500 per 5 gas compared to scavenger costs) but I'm also earning 500 TG's each run (1,250 figuratively on 5 gas). @DLich I use Maggie in Outpost as well (currently that's about all I run, with some Challenges mixed in there), then I switch to mainly Scavenge when it's upgrade time. With Maggie, it's ~16,000 per OP, but there are some low-XP ones thrown in there, so it's usually about ~65,000XP per 10 gas. For that cost, I can run 2 Normal Scavenge Missions with Maggie, each one netting a solid 60-70K (including normal crates, can be more with Gold crates) -- figure even on the low end it's over 100K per 10 gas. However this may change when I go to 8*, as Maggie won't be able to contribute quite as much to the farming cause.